I'm trying to rebuild the gearcase of the Whirlpool direct drive washer WTW5505SQ1. The problem was that it wasn't neutral draining and would drain and spin at the same time. I got a neutral drain kit that included all the parts including the spin gear and have replaced all the old parts but when I test it out (gearcase open and running in agitate for 13 rotations and then in spin) it neutral drains for about 3 rotations and then starts spinning. It needs full motor speed to work right. Put it back in the washer and check it out. I've never had one fail to go into neutral after installing this kit. I'm about ready to put everything back together, but there's a problem with the shaft seal. It doesn't seem to have one. I've attached a picture. When I tried scratching where the seal should have been it looked like it was metal. I've never seen one fall out on its own. I haven't put one in recently but I think they have a metal outer case so you can tap it in. Its hard to tell from the picture but the hole would be deeper if the seal was missing. I'm not sure how to remove it. I got a new part (285352) and there are 2 rings, a black one and a smaller orange one, in the package. Drive a drywall screw into it and it will pop right out. I thought it was missing, what is there to remove? I think the bag comes with two different sizes. Use the one that looks the same as the one you take out. The picture shows the seal is still there. I was wondering how much oil to put in? Should the cover be sealed on and oil added until it comes out of the pin hole? Oil level should be as shown in the photo. 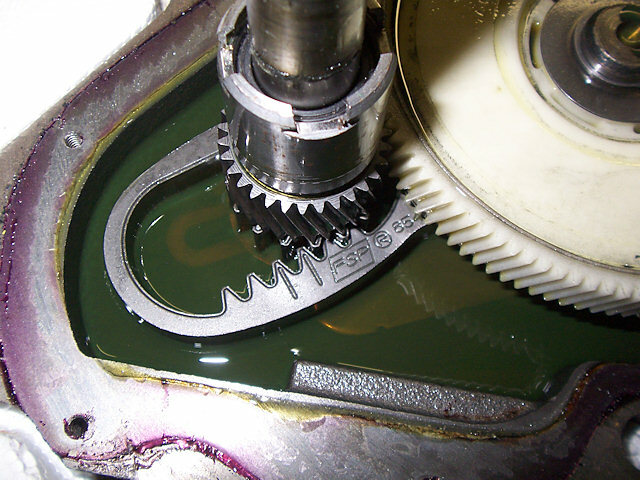 I tried moving the pinion gear manually clockwise and counterclockwise just to get things lubricated and when I shift to counterclockwise from clockwise, and the "shift actuator" contacts the "agitate cam" it gets pretty hard to turn. (I've double checked to make sure all the parts were installed correctly). Is this a problem? I meant to say, -- when I shift to clockwise from counterclockwise. That is - shifting into spin from agitate. It needs to run at the proper speed to work correctly. Iv'e seen that video before. The part where he shows how to remove/replace the agitator cam is wrong. He has the cam on first and then the cam follower. That's backwards. The agitator shaft he removes from the gearcase is done correctly but that's not the same shaft he shows closeups of when removing/replacing the cam parts. I'm having problems removing the shaft seal on the cover. It seems gasket sealer was used on it and it's coming off in pieces.